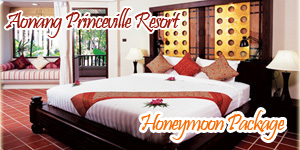 One can now easily take a vacation to Krabi and its surrounding regions to unwind. Krabi offers an exciting and memorable holiday where the ocean and tropical offshore islands become the favourite playground for all who made Krabi as their holiday destination and especially those visitors who made repeated trips annually. 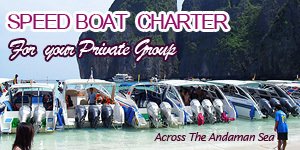 The Province of Krabi is easily accessible and affordable to travellers by land, sea and air. 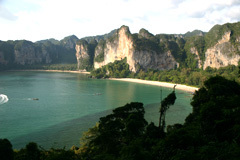 Located on southern Thailand’s east coast, 800 kilometres south of Bangkok, Krabi Province is an area of outstanding natural beauty covered with exotic islands such as world renowned, Koh Phi Phi. Classic virgin beaches competing with towering limestone formations and surrounded by crystalline waters fringing with colourful coral reefs.Beside the sea and sand, there are towering rocky cliffs, caves harbouring Buddhist temples, waterfalls, seemingly endless plantations of rubber and oil palm trees, lush and green national parks home to different species of fauna and flora, verdant mangrove forests and inlets that wind their way under soaring cliffs of karst mountains, and much more. As well as beautiful and relaxing scenery, Krabi offers a unique “Mother’s Nature” playground for those who like to be “out there”. Rock climbing, diving, kayaking, sailing, deep-sea fishing, bird watching, snorkelling, island hopping, elephant-horse riding, camping and barbecue activities are just a few. In the interior hinderland, two predominantly national parks, Khao Phanom Bencha and Than Bok-khorani, offer rainforest attractions including waterfalls and caves, hotsprings and opportunities for jungle trekking, bird watching and eco-tours.